The seas have calmed and we enjoy the final day of our expedition. Following breakfast, we pass Cape Horn, a point of historical events since so many found rounding its treacherous waters to be a dangerous experience. We have some time to look around the town of Ushuaia before heading off to catch our flight back to Buenos Aires, Houston and SFO. We wake up this morning to rocking and rolling on our way across Drake’s Passage. Few people appeared for breakfast and those who braved the dining room needed to hold on to railings in order to pull themselves along. We are now in the Waddell Sea above 65”S. Partly cloudy with sun pushing through. Beautiful bay with backdrop of volcanic mountains. We are the first visitors for the season as December 2017 was the last group able to navigate the ice floes often blocking entry. On shore is the hut where part of the Nordenskjold exploration group of 1901-04 carried a pre-fab hut for use during their winters on the island. Climbing up to an overlook we had a glorious view of the bay. We then hiked down the shoreline – a combination of snow, rock and mud -silt, with treasures of ancient fossils popping up to the delight of our naturalist guides. As we move along the edge we realize there is some tidal flow taking place and our zodiac landing spot has lost it water and is now in the mud. Our hike grows longer as we continue around a hillside through quicksand like mud to another accessible bay. We experienced a little more exercise and felt like true explorers. Following lunch, we arrive north at Devil Island, our afternoon playground. 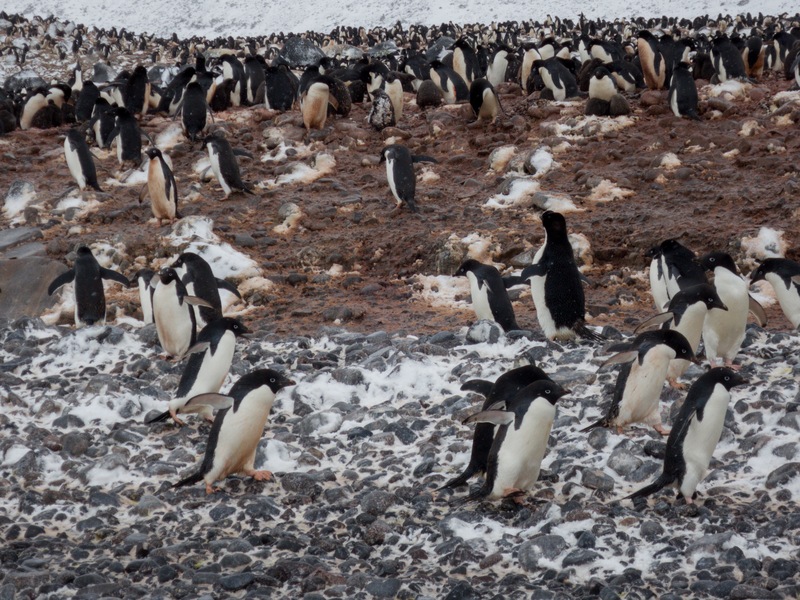 Wasting no time we are whisked to the island to view another major Adelie penguin rookery. For these adult and babies is was a very warm 41. A climb to the top of the island reveals views of the entire bay and the sea. After spending time with chicks, we motor back to the ship for an immediate turnaround to kayak. Jumping into our boats we enjoy being on the water at the same level as the penguins who are leaping all around us. We are using double sit on top kayaks wearing emergency beacons in case an unexpected dip occurs in the water. The ship is equipped with at least 12 kayaks so a substantial chunk of us are on the water at the same time. Nevertheless it takes rotating groups to launch 80-90 of us during the afternoon. Having a little time after kayaking, I jump on a zodiac back to the rookery for some last minute photos of the funny birds. If this wasn’t enough excitement, today is Plunge Day. All who wish to jump in the ocean are encouraged to do so under the observation and safety of the crew. Amazingly there were a number of those who made the choice including Jon. After a quick dip, the brave jumpers are pulled immediately up onto the outdoor platform for a dry towel, brandy and hot chocolate. The hot showers afterward took the water pressure down to a trickle. Late dinner with Rob, one of the naturalist. We cruised up to the tip of the Trinity Peninsula, through the Antarctic Strait to Paulet Island. This is more like the Antarctic experience: cold, windy, and snowing. Can’t wait to get off off the ship! Jon had a little food issue last night so he left the island exploration to me this morning. I hurried to suit up with as many layers as possible and then some. I was certain to be identified as one of the fat penguins due to my rotund form. The crossing was wet and the landing on Paulet was a soaker. As protected as possible, the bay was still roiling. The noise and smell alerted us to the inhabitants: Adelie penguins. They covered the beach and hillside for as far as one could see. 200,000 is the rough estimate for the island. Sitting quietly on the rocks, the penguins waddle past me showing off their latest rock maneuvers. Moving off the beach and up the hillside is the nursery. Here the chicks are in all stages of development. Before leaving the island, a few stray birds marched down to the water to check out our ship. The afternoon we pulled up to Joinville Island, Tay Point and landed in the middle of a windy snow storm. The terrain was similar to Half Moon Island with uplifts of rock along the beach. 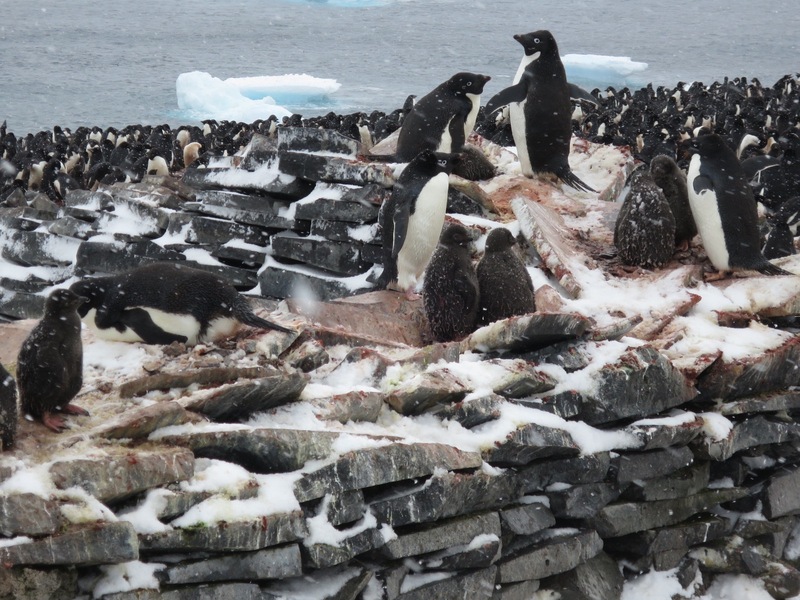 In addition to the penguins there was a mummified leopard seal and a living waddell seal. Visibility was limited. The new year starts a little slower after the late night celebration. We pull into Flanders Bay, Etienne Fjord. Alongside us is the sister ship, the Orion. We are going to spend the morning on the fast ice. 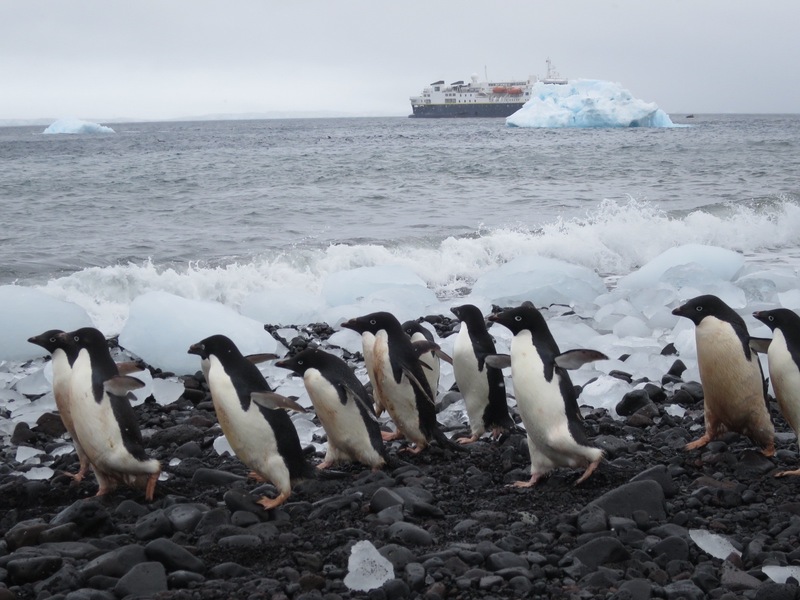 Upon embarking from the zodiac we are greeted by some Adelie penguins playing along the ice shore. Passengers and crew from both ships enjoyed sharing the visual experience on this build up of thick ice attached to the land. Seals and penguins including a couple of emperor penguins greeted us on our hike. Walking was a challenge since it didn’t take much to break through the snow crust. There were some deep pockets from which Jon had to climb out using his poles and upper body strength. He must have stepped in a 100 holes. The valley is capped by the glacier tail coming down toward the water. The mountains surrounding us had some avalanche activity while we were admiring the rest of the snow field. It is a calm morning on Portal Point, Charlotte Bay fjord. On this peninsula we were rewarded for our hiking with incredible views of glaciated mountains. A zodiac trip introduced us to the humpback whale and more seals. We cruise through the Lemaire Channel/Gerlache Strait for our New Years Eve celebration. We have daylight to celebrate the beginning of 2019. Before we know how late it is, the ship’s bell rings in the new year by the youngest and oldest person on board. The crew, captain and staff were all around to toast and party with our group.